There was just something about the light, the natural morning light, that lit up this childhood world constructed in the laundry room. We took out our camera and made a quick snapshot on our way to the car in the garage. We had work to do. 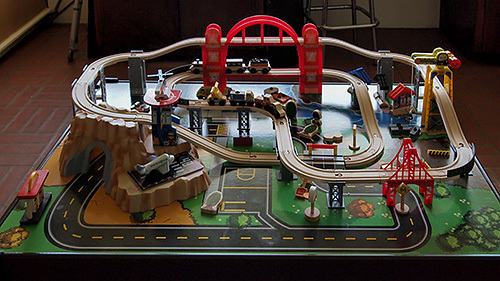 Train Set. A world within reach. A little detective work -- with ExifTool wrapped in our contextual menu for it -- reveals it was taken at f4.0 for 1/60 second with ISO 400. We revisited it today as we were looking for another old image we have to reprint. First we corrected the perspective in Photoshop CC 2104. Julianne Kost explains just how easy this is in Upright Perspective Corrections in Camera Raw for Photoshop CC. Perspective correction in both Photoshop and Lightroom (which has a similar Upright tool) has become a regular part of our workflow. Speaking of working, we also did a good amount of slider sliding to keep that sheen on the board (which cleverly sits on a low table with a big drawer in it to store all the pieces). And bring out the glow of the red plastic on that big bridge. Every kid should have their own Golden Gate bridge. And, for that matter, their own Statue of Liberty. Until they do, we adults have some work to do.